A 14 metre Princess motor boat has been washed from the deck of a cargo ship and destroyed against the rocks on the coast of Norway. Cargo is often lost off the back of ships, but this could be the first time a boat has been swept off whilst being transported. The 90 metre cargo ship Kristian With was transporting her cargo of boats from Molde on the West coast of Norway to the Oslofjord in the South East. 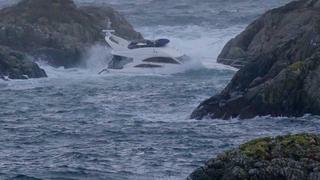 As she was passing the South West coast a huge wave swept the Princess motor boat from the deck. The cargo ship's insurance company sent out a salvage tug, but the seas were too big and it was impossible to save the vessel. After drifting for seven hours, the unmanned boat ran aground just south of Egersund. It has now sunk after being smashed against the rocks by the waves. This is the second Princess to have been destroyed in an accident in recent weeks. The Princess 95 Queen Anna caught fire in Turkey on January 21. Earlier this year bad weather also hindered rescue teams that were trying to stop a cargo ship from running aground. 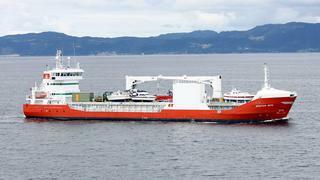 Eventually a last ditch effort saved the listing cargo ship from reaching the French coast. Due to adverse sea conditions, another rescue attempt was unsuccessful in South Africa. Rescue teams were towing the upturned Sunsail catamaran, which went missing over a year ago, when it broke free of its tow and was lost again.